Y’all we are almost at race day and I’m so excited! I’ve had an unusual week and right now am writing this from the airport in Denver. I’ve been here just for two days and it’s been cold and snowing. When I say cold, I’m talking one degree. Yeah. So there was no running outside during this trip. I’m running on the AlterG again tomorrow and then will shake the legs out Friday. And then, it’s race day! A Goal – this is if everything is perfect and all goes as planned. Given that the weather is right now forecasted to be a bit chilly, this is the goal for if everything else comes together on race day. 4:30-4:45. This time is totally doable given my long runs during this training cycle. It won’t be easy but if I push it, I can do this. B Goal – this is next best thing if I can’t run in 4:45 or less. 4:46-4:59. C Goal – this is if I have a bad day and not many things go right. A PR. (faster than 5:27). I’m really optimistic and know that I’ve put in the work and the training to run well. It probably won’t be perfect but I’m already proud of the work I’ve put in and excited to head back to Richmond, where my marathon journey first started a year ago. I’m excited to have people I know running (K, my friend Meghan, Christine, etc.) and I’m excited that I already know this course. I remember it pretty well and am ready to Run Richmond! If you’d like to track me, my bib# is 5202 and you can find the runner tracking info here. Who else will be running Richmond?? Thanks Karen — I’m really excited! Woo hoo Marathon weekend!! Can’t wait to track/cheer for you. Good luck to both you and K! I love that you have a few different goals, that’s really smart! I’m sure you will do great and I can’t wait to hear about it! I am thinking that Richmond would be a good marathon to do one of these days. Thanks Deborah — I’m really excited! That Denver chill is just getting you ready for Richmond! Kick A$$ and take names this weekend. Maybe I’ll run into you. Brr! Glad it won’t be that cold for Richmond. That’s REALLY cold, and I’m from the Great Lakes area. Good luck this weekend! I’m looking forward to hearing all about the race 🙂 You’ve put in a lot of great training, so I’m sure you’ll do wonderfully! Have a blast!!!! I’ll be thinking of you Wazelley friends down there! And I love that you’re on track to PR no matter what 🙂 Run strong! I’ve been following your training and I think you have sub 4:30 in you!! Can’t wait to see how you do! Wendy@Taking the Long Way Home recently posted…Maybe her pants were on fire? Lol – i just feel extra special! Good luck from NYC! Wishing you no wind, good temps and fast feet! 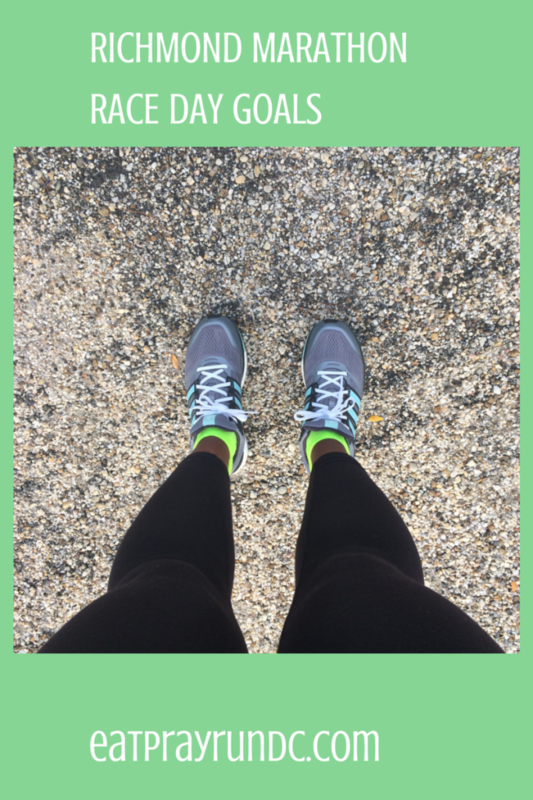 delana recently posted…The Power of Habit…and, So…What’s next? Just signed up to track you! Can’t wait to cheer you on this weekend! You’re going to rock this race! Aw, thanks – that means a lot!! My parents are in Boulder so they’ve been telling me how cold it is. It also keeps Dallas cold, and 31 in Dallas feels so much colder than anywhere else I’ve lived. Boston 31 is doable, Colorado 31 is doable, but Dallas 31 is awful. It was pretty chilly. The dry air was a plus but still! One degree???? that’s just unacceptable! 🙂 I am SO super excited for you!! I remember “meeting” you virtually during your first go round with Richmond. You’re inspiring and happy to call my friend (IRL!!) So many good lucks and I’ll be tracking you!!!!!!!! You got this! I’m a little concerned about the cold start but other than that I’m shooting hard for sub-5! Good luck to you! We can do this!! Have a great race – maybe we’ll see each other out there! You go girl! Have a great race! Woo hoo! I’m so excited for you, Courtney; you’re going to do GREAT! Hope K is feeling good about the race; so cool that he’ll be doing his first one at the same time. I’ll be thinking about you! Thanks Tara – I’m so excited!! I hope you have a great race and at least it will be warmer than Denver! Given this is my first long race my main goal is just to finish but my secondary goal is to finish the half in 3 hours or less. I think it should be do-able given my training run times. Chaitali recently posted…What to wear for a cold race? thank you – i’m really excited!! I hope your race goes awesome! Being able to see the benefits of all the hard work we put into training is such a huge reward in running!!! I love how you are heading back after a year ready to go! Your goals sound very attainable for you, so get rested tonight!!! Its the one that really counts! Staci @ Hoosier Running Mom recently posted…To race or not to race? What a loaded question! Woo-Hoo! I’ll be there! I’m super excited! Your goals are very similar to mine! I’m going in hoping to be somewhere between 4:30 and 5, (best case scenario is closer to 4:30). 😉 Although, the cold is a bit of a bummer, but at least it’ll be drier than last year! hope to see you there karen! 🙂 good luck! You’ve got this! I have total faith in you finishing and finishing strong. You’ve put in the work, now go have fun! MCM Mama recently posted…I heart Skirt Sports! thanks so much, friend! here’s hoping!! Oh, and 1 degree??? Crazy! thanks for the kind words! and yeah, that weather was cray cray! Well, at least the Richmond weather will seem warm after being in Denver! I’m so excited for you! Daisy @ Fit Wanderlust Runner recently posted…Two Year Wedding Anniversary! Good luck! You have been killing your training, so I’m excited to see how it goes for you! If you hit your A goal, you will have an insane PR! Have a great time in Richmond!! You are going to rock it. Your training has been so strong! Can’t wait to hear about it! Good luck Courtney!!! You’re going to kill it, can’t wait to hear all about it!